Ridgewood Residence one of Baguio's finest hotels. Ridgewood Residence have you stayed here yet? Located in the Philippine's summer capital, the Ridgewood Residence Hotel is one of Baguio City's top hotels. A country-style hotel/apartelle, Ridgewood Residence is said to be synonymous to quiet, serenity, style and comfort, definitely one of the best choices for any purpose if your staying in the City of Pines, be it for a couple's honeymoon, family or group of friends' long weekend vacations, or for any company functions like conventions, seminars, or retreats. The Ridgewood cater for all. About 30 kilometers away from the local trade fair center, the Ridgewood Residence provides a business center, currency exchange services and tour desk and laundry service. Guests can also enjoy the nearby horse riding facility and jogging track. Most visitors say The Ridgewood is a clean, comfortable tourist's hotel which offers the convenience of first-class amenities in bright, cheerful surroundings at reasonable rates, I guess you can't go wrong with review like that. How do I get to Ridgewood Residence in Baguio? To get there, take the military cut-off road straight to South Drive then turn left to Illusorio Drive. Upon reaching Pacdal Circle, take Romulo Drive (along which you will see the mansion on your right) then turn left to Julian Felipe Street. Or you could take Governor Center Road which connects to North Drive and Leonard Wood Road. Upon reaching Pacdal Circle, take Romulo Drive (along which you will see The Mansion on your right then turn left to Julian Felipe Street. The hotel offers 51 hotel and apartelle type rooms/accommodation to suit your needs. They say each room has orthopedic mattresses, continuous hot and cold water supply, TV with cable channels, coffee/tea making facility, swipe card door lock system, a minibar in suites, family rooms and apartelles, phone system with IDD and NDD facility and a smoke detector and fire alarm. Aside from these, the bigger apartelle suites have in addition a dining room and kitchen facilities. The hotel’s dining facilities include a restaurant and bar, located at the lobby level with a seating capacity of 40 people, the restaurant serves a great variety of international and local cuisine. There is also the Verandah Rufina, an outdoor coffee shop with a fire place. It has seating capacity for 30 people. For function facilities, there is the Rocka Hall which is located on the 6th floor of the hotel wing. It is best for seminars, meetings, receptions and conferences up to 200 people. Tourists agree that the hotel is one of the most romantic places in the country. The lobby/restaurant area was very nice, all wood and stone, especially the fireplace – it is a very cozy; it leaves you with the feeling of being in a homey place. A nice place to relax. Nice landscaping. Food was excellent and there was a good variety. 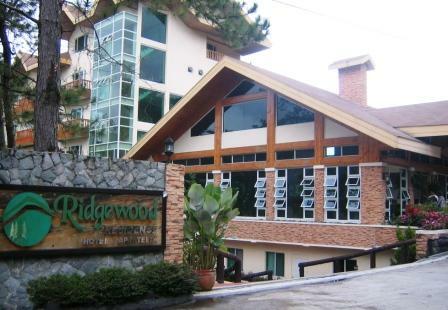 Some say Ridgewood residence is Baguio Country Club and Camp John Hay Manor all rolled into one. It also said that the hotel has one of the best bathrooms that they have seen in the country. Taxis can be reached within easy walking distance. Is the Ridewood Residence worth the money? The hotel is also in a nice quiet neighborhood. Although sometimes early mornings can get a bit loud with the local dogs and chickens, but everywhere in the Philippines seems to be like that. So yes the Ridgewood Residence is worth the money in my opinion. 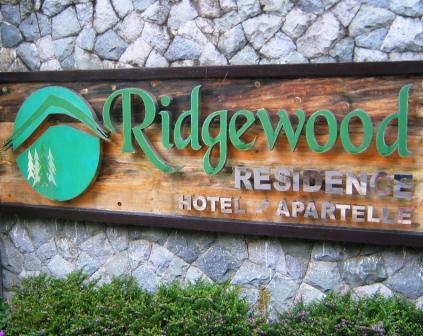 Have YOU stayed at the Ridgewood Residence Baguio City? Share your tip or review on the Ridgewood Residence Baguio City with everyone!